Camel Christmas and Book Fair at CAC! Merry Christmas everyone! I hope during this festive time of year that everyone enjoys some holiday spirit and well-deserved time off. I personally always take some time to reflect and think ahead of my goals or resolutions for the New Year. During the annual CAC Book Fair this month, I was invited again to read my books as an alumni. It was so wonderful to sit again at school and feel the spirit of the students. I read The Magic Palm and The Lion that Dressed as a Sheep, and signed books for students who wanted to buy copies. 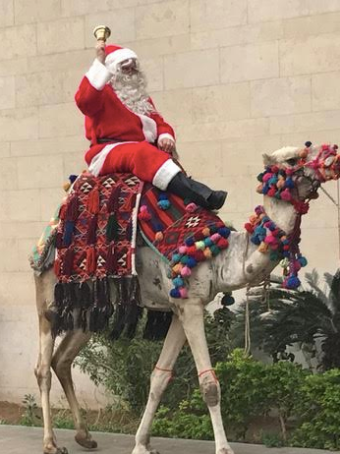 Some fun pictures from the day – and Santa riding a camel! Previous Book Reading at Alsson School, New Giza! Next Room to Read – Publishing 20 Picturebooks!